rec. Nimbus Records, Wyastone Leys, Monmouth, UK, 16-17 April, 8 May 2012. This set is another discovery for me as I not heard of Óscar Esplá before. One of the joys of reviewing is the continuous opportunity to uncover new composers. Esplá was born around 1889 - his precise year of birth is unsure - putting him between Albeniz, Granados, de Falla and Turina and Mompou and Rodrigo. That there were other composers around at this time shows how musically rich and productive the early years of the 20th century were in Spain, particularly for piano music. Given the exciting rhythms and lovely melodies that abound in the folk music of the Peninsula it is hardly surprising that all those composers were driven to use these elements in their compositions. This goes to show that the best Spanish music was not written by non Spaniards as has often been claimed but by a plethora of extremely gifted native Spanish composers. That Esplá was one of these is amply shown in these two CDs of ravishingly gorgeous little gems. The first item dates from 1905 when the composer was a mere 16 year old. It is surprising how much of a feeling of wistful nostalgia he managed to inject into Romanza Antigua, as if he was writing in exile. The five sections in his Impresiones musicales Op.2 were also composed between 1905 and 1909. They are charming evocations of children’s stories such as Little Red Riding Hood and Cinderella. The booklet notes say that he did not turn to music at an early age, though 16 seems young to me. In 1911 his orchestral Suite levantina won the International Music Society Prize and was described by a jury, that included Richard Strauss, as ‘one of the greatest and definitive works to be written since César Franck’. What a fantastic vote of confidence that must have been for the young composer. Most of the pieces on the two well filled discs are miniatures but there are some more substantial works such as his Scherzo Op.5 and Crepúsculum Op.15 both of which allow him scope to develop his ideas more fully. The Scherzo is gorgeously dreamy while Crepúsculum is extremely effective as a musical evocation of twilight. It’s quite reminiscent of Debussy. The music here covers the period from Espla’s earliest compositions until 1949. Disc two concentrates on his middle period from 1930. Throughout his life he was continually inspired to explore the folklore of the Spanish Levante, the region of the east coast of Spain where he was born (in Alicante). His Lírica Española I: Bocetos levantinos (Levantine Sketches) are from the 1930s (precise composition dates are unknown). They are perfect examples of this fixation, with musical depictions of the coast, local dances, songs and other melodies. If a wistful air of nostalgia is detected in any of these pieces then that could be explained this time by the fact that he and his family sought refuge in Belgium during the Spanish Civil War and he didn’t return to Spain for many years. What I found refreshing in all the works on the discs is an air of childlike innocence that helps to make them immediately attractive. As is so often the case with well composed miniatures, there is a wealth of material within their tiny time-frames. 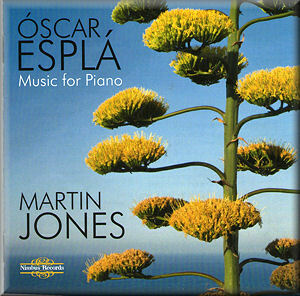 Martin Jones who has recorded piano music from as wide a range of composers as Szymanowski and Stravinsky to Granados and Gál is the perfect advocate for these wonderfully simple but beautifully crafted delicate little pieces. He plays all of them with great sensitivity and a real feeling for the colour. It is to be hoped that these two discs will help in bringing this composer to a new audience.